No rustic patio or deck is complete without a good set of chairs. Fill those empty spaces on your patio with our hand-crafted solid log pole pine Patio Chairs. Sit with comfort and ease on the beautifully contoured seat. Each chair is meticulously crafted using a hand peeling process creating a skip-peeled texture. First we remove the outer bark while leaving the inner, cambium layer behind for added texture and contrast. Then the finish is completed in an eight step professional spraying process that applies stain and lacquer for a beautiful, long lasting finish that separates our Glacier Country line from the rest. 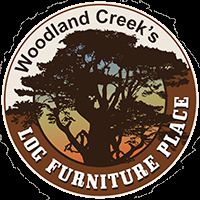 Complement your rustic lodge or log cabin with more of our rustic furniture and decor.